Linked list creation and traversal is the stepping stone in data structures. In this article, I will explain how to create and traverse a linked list in C programming. I will explain step by step process to create and traverse a linked list of n nodes and display its elements. Write a C program to implement Singly linked list data structure. C program to create a linked list and display elements of linked list. 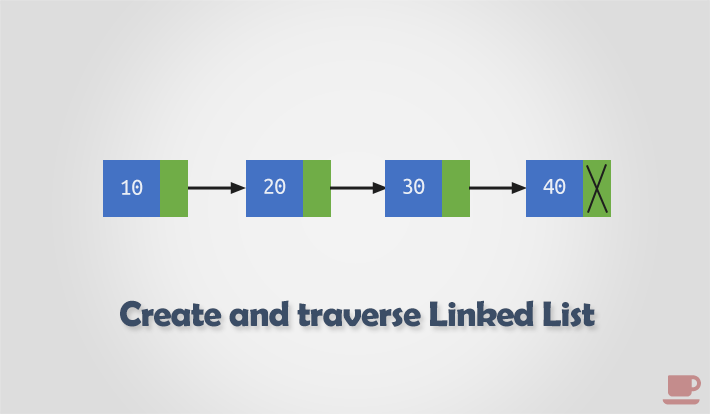 How to create and traverse a linked list? In previous article we discussed about singly linked list data structure, its need and advantages. Here we will learn to create and traverse a linked list in C program. How to create a linked list? Step by step descriptive logic to create a linked list. Where data is the data you want to store in list. *next is pointer to the same structure type. The *next will store location of next node if exists otherwise NULL. Note: The node structure may vary based on your requirement. You can also have user defined types as node data section. Declare a pointer to node type variable to store link of first node of linked list. Say struct node *head;. Note: You can also declare variable of node type along with node structure definition. Input number of nodes to create from user, store it in some variable say n.
Declare two more helper variable of node type, say struct node *newNode, *temp;. If n > 0 then, create our first node i.e. head node. Use dynamic memory allocation to allocate memory for a node. Say head = (struct node*)malloc(sizeof(struct node));. If there is no memory to allocate for head node i.e. head == NULL. Then print some error message and terminate program, otherwise move to below step. Input data from user and assign to head using head->data = data;. At first head node points to NULL. Hence, assign head->next = NULL;. Now, we are done with head node we should move to creation of other nodes. Copy reference of head to some other temporary variable, say temp = head;. We will use temp to store reference of previous node. Allocate memory and assign memory reference to newNode, say newNode = (struct node*)malloc(sizeof(node));. If memory got allocated successfully then read data from user and assign to data section of new node. Say newNode->data = data;. Make sure new node points to NULL. Now link previous node with newly created node i.e. temp->next = newNode;. Make current node as previous node using temp = temp->next;. Repeat step 10-14 for remaining n - 2 other nodes. How to traverse a linked list? Step by step descriptive logic to traverse a linked list. Create a temporary variable for traversing. Assign reference of head node to it, say temp = head. Repeat below step till temp != NULL. temp->data contains the current node data. You can print it or can perform some calculation on it. Once done, move to next node using temp = temp->next;. Go back to 2nd step. Insert a node at the beginning of a Linked List. Delete a node from the end of a Linked List. Delete all nodes of a Linked List. Count number of nodes of a Linked List. Search an element in a Linked List. Swap two nodes of a Linked List.